M2 thread straight stylus with a Ø2 mm ruby ball, 20 mm in length, EWL of 14 mm and a stainless steel Ø1.4 mm stem. and holes with which direct contact can be made. This configuration gives flexibility, enabling the tip to make contact with features without changing the stylus. You can configure your own star styli using stylus centres to mount up to 5 styli components. The balls can be made from ruby, silicon nitride or zirconia. Each tip on a star stylus requires datuming in the same manner as a single ball stylus. Star styli are not recommended for use on machine tools. 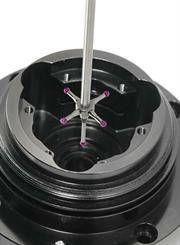 (from the centre of the ball to the rear of the star mounting face when assembled on a probe). The span of the star cluster is 32 mm.